This product requires the base game Ship Simulator Extremes. 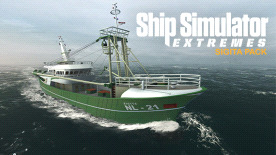 Roam the oceans and sail into famous ports worldwide with the Fishing Trawler vessel "Sigita" and take on no less than six specially created bonus missions for this vessel, adding to the simulation fun. Business as (un)Usual: Take the Sigita to respond to a distress call from a nearby yacht in trouble. Changing Fishing Grounds: Gather your crew and sail the Sigita to new fishing areas. A Hot Day: The Sigita runs into trouble during one of her fishing trips. Make sure you evacuate and then take control of the coast guard as you try to find crew in distress and put out the fire on board the fishing trawler. First Fishing: During one of its voyages, the Sigita trawler is called upon to use all its horsepower and navigational skills to tow a colleague back to a nearby oil rig. Meet and Greet: Sail and manage several vessels at the same time as you try to berth them in a busy harbour. Unexpected Operation: Deliver spare parts for the Sigita's damaged sister ship and help the repairs in the midst of a very heavy storm. Ship Simulator Extremes is required to play this DLC.